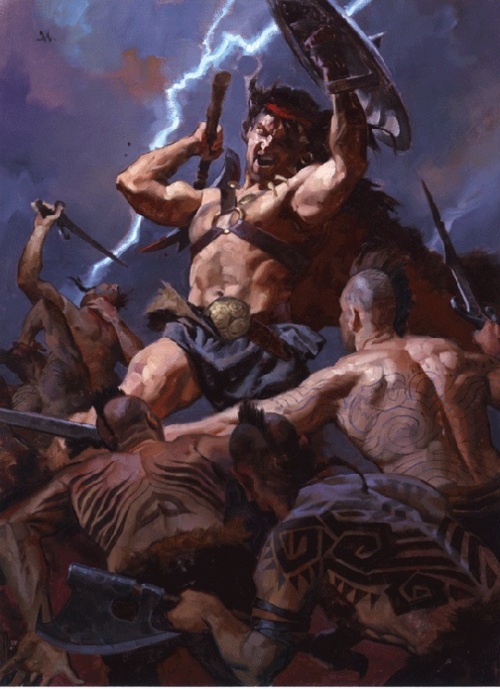 “Beyond the Black River” is a frontier story set in Robert E. Howard’s Hyborian Age. Art by Greg Manchess. Bill Ward and Howard Andrew Jones are embarked on a deep re-read of the Robert E. Howard Conan stories, and producing excellent essays on each. 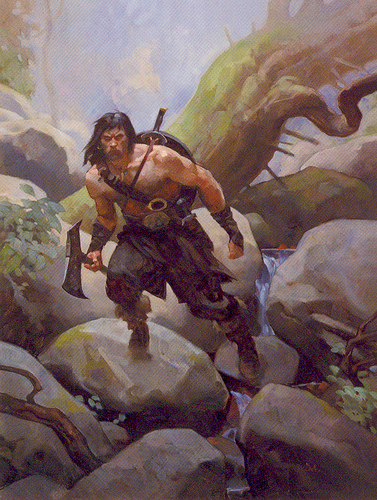 The current re-read is “Beyond the Black River,” which is hands-down my favorite Conan story. For in it, Howard tapped his Texas roots and his growing fascination with frontier storytelling, transferred its tropes into his Hyborian Age— and produced a minor masterpiece. Howard was obsessed with the history of the dark and bloody ground of his homeland. He had also read much of the work of Robert W. Chambers and Joseph A. Altsheler, who wrote extensively of the early colonial frontier. In “Beyond the Black River,” Howard translated the American frontier into a fantasy setting, which allowed him the liberty to take themes that have resonated through American history and literature in a strange and dark direction. Read the Jones/Ward plunge into the Pictish Wilderness — then go read the story. You’ll be glad you did. Those Manchess paintings … So damn good! Yeah, I really like the feel of his work, especially for that story and The Black Stranger. It’s been many years since I read this. I’ll have to see if I still have it around somewhere readily available (thousands of books in boxes, naturally). I’ve never seen those paintings – absolutely terrific! Yeah, something rather “Wyethy” about those paintings!